We were all glad that we would be sleeping in our own bed this evening because the terrain we had just slept on had to be the most difficult to date  it was almost impossible to locate the right position without being poked by a rock or a root or slipping downward in our sleeping bags. 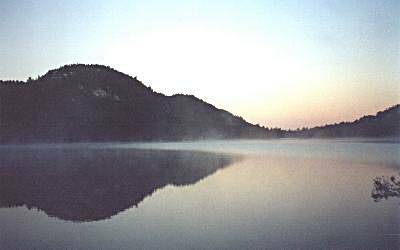 We decamped in short order and ate a good breakfast before paddling across a calm, tranquil Grace Lake. As we approached the middle of the lake, we could speculate, based on the layout of the landscape that our final portage was not going to be too strenuous. At the second campsite, two campers, sitting in their lawn chairs drinking coffee and enjoying the sunrise, confirmed our thought on the upcoming portage. At the end of the lake, we gazed back and were rewarded with a solitary, panoramic view of Grace Lake. At our last portage (31P1745), we found two empty canoes and suspected that their owners were transporting their equipment to Cranberry Bay. Halfway through the easy-going portage, we met four cheerful women who had entered the interior of the park two days prior to our arrival. As an inside joke, Wayne immediately asked them whether they were nurses, but as it turned out, they were retired teachers from Sudbury  with self-preservation foremost on our mind, we convinced ourselves that these four women also had to be nuns! We had a few laughs over this unexpected "rendez-vous". 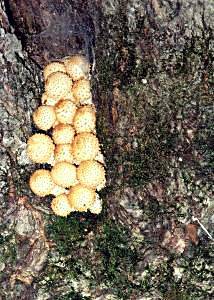 Along the trail, we noticed several species of fungi on fallen, rotting trees and various kinds of mushrooms. There was also an abundance of poison ivy with its shiny, green trifoliate leaves visible off the main path - as it had been throughout our trip. 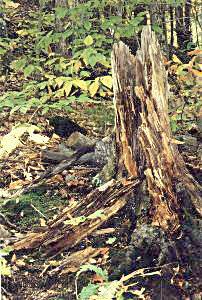 In the damp mud, we identified raccoon tracks as well as those of a lynx. 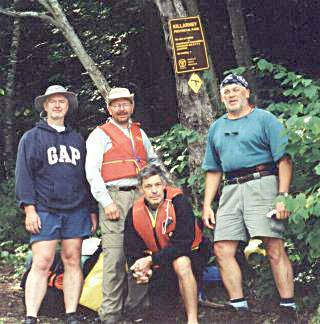 We blinked at the dazzling brilliance of the sun framed on the enclosure of Cranberry Bay as we emerged from the dark, forested portage. Time seemed irrelevant and we took advantage of this to reminisce one last time. 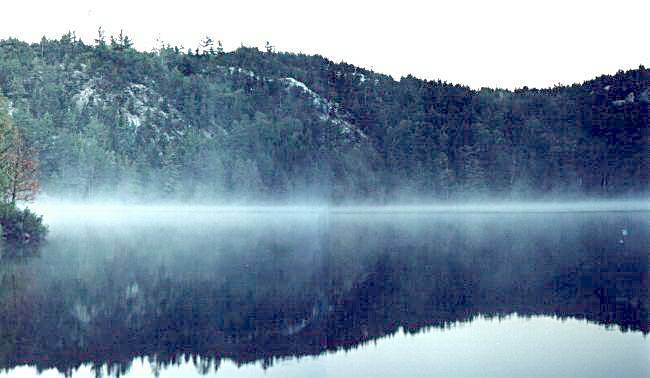 Killarney Provincial Park is truly a vast and beautiful tract of wilderness, with clean blue and sometimes aqua lakes, a spectacular range of white quartzite ridges that dominated the La Cloche Mountain range, pine and hardwood forests, boggy lowlands, and a wide variety of plant and animal life. It is a special place that deserves respect from visitors  respect for its beauty and remote character, but above all for its unique environment. Over the 6 ½ day trip through Killarney Provincial Park, we accomplished paddling 95 km over twenty-six (26) waterways, trekked over thirty-one (31) portages covering 12.6 km, but with two-trip portaging, the overall distance was 37.8 km of hiking, and hauled our canoes over eleven (11) beaver dams  it provided us all with an appreciative insight on the parks unspoiled wilderness - a natural Canadian heritage. The park had lived up to our expectations and more  the trip was a resounding and unforgettable success and its memory will remain etched with us forever. 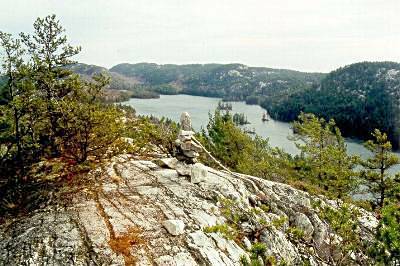 Our trip through Cranberry Bay and across Frood Lake would be the final test as we faced strong westerly headwinds that funneled through the ridges and narrow channels; however, the shorelines and hillsides compensated with their spectacular characteristics and beauty. As we paddled along Frood Lake, we were left with mixed feelings of joy and emptiness. We were happy to have successfully completed the trip, but we also had a hollow feeling, knowing we were about to leave this majestic eco-region. Rounding the point into Willisville, we suddenly confronted reality again when we saw many residences displayed with a Canadian and American flag at half-mast - our wilderness trip became secondary and we gave deep thought to what the future had in store for us.